I was walking a route I hadn’t travelled in four years, past impromptu gatherings of daffodils on the roadside, fences propping up creaky fruit trees, and bicycle art. The spring air still had a crisp feeling whenever I walked in the shadows, cloaked in the moistness of the nearby sea. I was back on Saltspring Island, visiting my sister and brother-in-law, who have returned after a few years in Vancouver, B.C. Though I had once considered making this special island my home, I have always been a visitor, happy once again to slip into a more relaxed pace for a few days. 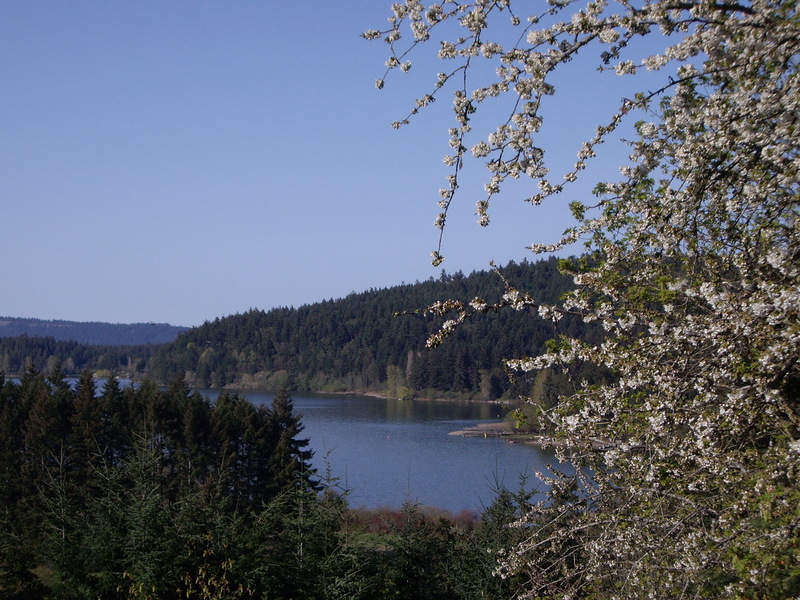 St. Mary’s Lake, Salt Spring Island, B.C. My sister’s place overlooks St. Mary’s Lake, which provides both a bucolic view and a water supply for nearby residents. While ravens croak along the treetops, eagles cruise the altitudes sailing past local hills and mountains. Today I heard a flock of Canada geese, those feathered wayfarers who seem to show up everywhere and yet still intrigue me. The robins here are fat and sassy, hopping through the garden in search of a morsel. Many different birds sing in the trees. Deer have a longstanding route around the house – last night we saw a pair of yearlings on the ridge out back, about 25 feet away. Morning time means coffee in the living room, gazing out the large picture windows at the lake, listening to and watching all the wildlife, glad that this place exists and that my family has returned to it.